BLYTH, ON – An upcoming evening of Southwest-themed barbecue, fiddle music, dancing, and a live auction will raise funds for the Blyth Festival’s New Play Development program, which has helped to make possible such plays as The Pigeon King, The New Canadian Curling Club, Prairie Nurse, The Last Donnelly Standing and more than 135 other world premieres. 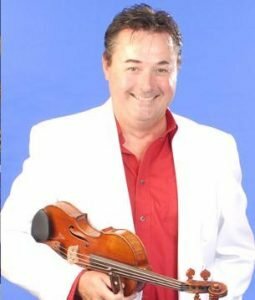 The Blyth Barn Bash, on Thursday, Oct. 18 upstairs in the Blyth & District Community Centre, features world-class (and deeply local) fiddler extraordinaire: Frank Leahy. Leahy was influenced early on by the legendary Canadian fiddler Don Messer whose music was broadcast to Canadian homes on the CBC, right after Hockey Night in Canada. Leahy himself now owns one of Messer’s original fiddles. Leahy will be accompanied by a handful of brilliant musicians. “At Blyth Festival we celebrate originality and all the nuances of being Canadian. It is not just tradition, it’s our mission. Frank Leahy’s music is a perfect fit for the Barn Bash. It’s deeply traditional, energetic, proudly Canadian and most of all fun. After the close of a wildly successful summer theatre season, we’re ready to kick up our heels. The Barn Bash is a chance for Blyth Festival fans and residents in the area to celebrate with us, and help us keep our commitment to developing and presenting new stories that resonate not only here in Huron County but across the country, ” said Jennifer Lamb, Director of Development. CTV journalist Scott Miller is Master of Ceremonies for the evening that includes: a Southwest-themed barbecue dinner catered by Part II Bistro; a live auction of experiential packages through the evening; and square dancing led by a caller. Reception 6:30 p.m.; Dinner 7:30 p.m.; Music 9:30 p.m.
Leahy has performed around the world as a soloist in more than 2,000 symphonic pops concerts, theatres and music theatre runs. His original hit shows include Bending the Bows, Road to Carnegie Hall with Eduard Minevich, An Unlike Affair with Janice Martin and A Fiddle Player’s Take on the Symphony Orchestra with Tom Szczesniak. Tickets, $100 ($110 after Sept. 27), are available at the Blyth Festival Box office, 1.877.862.5984, or online. A $50 tax receipt will be issued. Tickets are also available for the dance only. Come at 9:30 p.m. to dance to Frank Leahy for $40.